Within the framework of the 23rd Azerbaijan International Telecommunications and Information Technologies Exhibition and Conference Bakutel 2017, a seminar was held on the development of national capacity in the e-government, e-participation and open government. 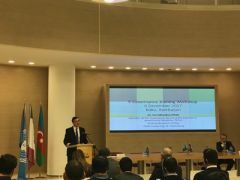 The workshop was jointly organized by the Ministry of Transport, Communications and High Technologies of the Republic of Azerbaijan, the United Nations Development Programme office in Azerbaijan and the University of ADA. The workshop was aimed at providing detailed information to civil servants on the development of national capacity in e-government, e-participation and open government and international experience in this area. During the workshop, the UN’s international experts gave recommendations to the civil servants with a view to raising theoretical and practical knowledge, further expansion of work in this direction by state structures in this country. Civil servants received information on capacity building towards measuring and assessing e-government readiness (METER) and the method of measuring the level of citizen involvement and e-participation (METEP). In addition, the attendees of the workshop were also informed about international standards for open government, social media and cybersecurity. Experts believe that the knowledge gained during the workshop will play an important role in raising the ranking of Azerbaijan in the UN E-Government Report ( E-Government Survey) in the years to come.